You must login after registration and after being logged out of a previous visit. You have the choice of the normal login screen, and the quick login options. This is the screen you see when you use the "Login" option of the main menu. It is also the first thing you will see in any 'members only' forum. Username - The member's username. Password - The member's password. OpenID - The member's OpenID. This is only displayed if it has been enabled by the forum administrator. Minutes to stay logged in - The number of minutes the browser cookie will last before expiring. Always stay logged in - Prevents the browser cookie from expiring. 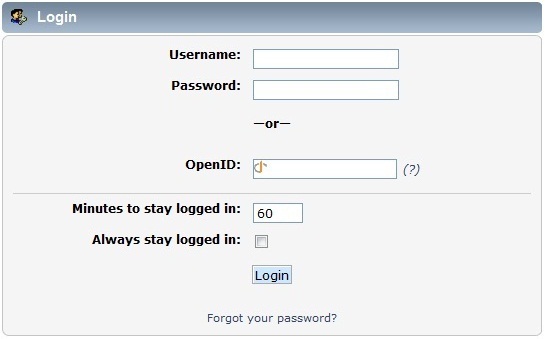 When using a shared computer, a member probably should not stay logged in for a long time or check the "Always stay logged in" option, unless they remember to log out when finished. Leaving an account logged in on a shared computer makes it vulnerable to use by someone other than the member. An SMF forum may be configured to allow login from any page. This is called Quick Login. In the default theme it is located in the top, left corner of each page. Other themes may place it in different locations. If Quick Login is disabled or cannot be seen, the login screen can still be accessed from the main menu. The session length drop-down menu corresponds to the "Minutes to stay logged in" option from the main login screen. Similarly, selecting "Forever" in this drop-down menu is the same as checking the "Always stay logged in option" on the main login screen. If a password is forgotten or lost, it can be reset by selecting the Forgot your password? option from the login screen. The username or email address for the account is requested to begin the password reset process. 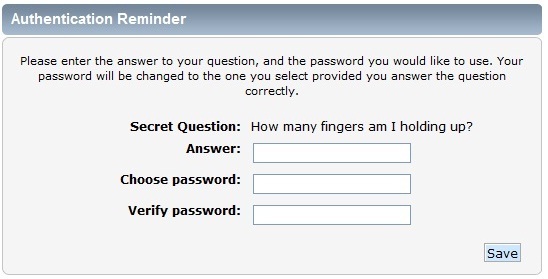 After answering the secret question correctly, a member may choose a new password. The password takes effect and can be used to login immediately. When you have finished browsing the forum, you may decide to logout by selecting the Logout option from the Main Menu. Page created in 0.232 seconds.